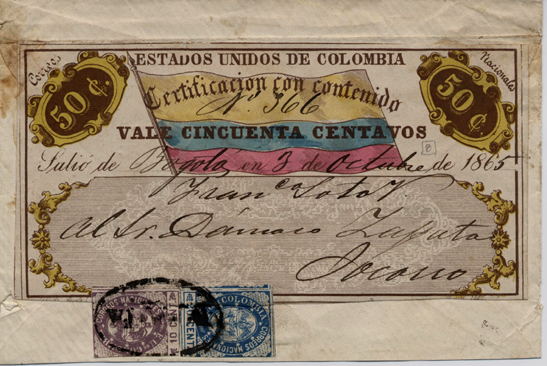 In 1865 Colombia issued the first of its unique cubiertas that were used to send within the country aper money, bonds, letters of credit, etc with a weight of no more than 20 grams. Shwn here is one of two recorded 50¢ cubiertas of 1865 on cover. The one here was sent from Bogota - Socorro, October 3, 1865. The 30 centavo stamps of the 1865 issue paid for the excess weight at a rate of 10¢ for each 15 grams.